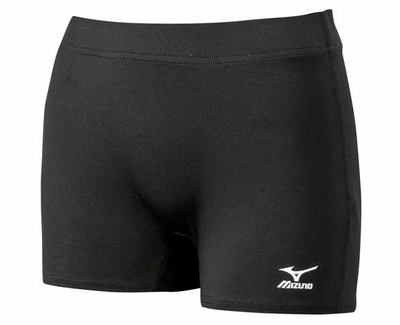 These Mizuno moisture-wicking Flat-Front Volleyball Spandex Compression Shorts are great for practice or competition. Made with Mizuno's DryLite fabric, moisture is quickly transported away from the body, keeping you cool & dry during intense competition. A great pair of volleyball spandex shorts for your next game or workout! A women's exclusive fit... sitting lower on the waist, with a 2-3/4" inseam. � Mizuno runbird logo, � Tagless care label. Mizuno Flat Front Volleyball Spandex Sizing Chart: (Waist) - approx. XSmall (21-22); Small (23-24); Medium (25-26); Large (27-28); XLarge (29-30); XXLarge (31-32). 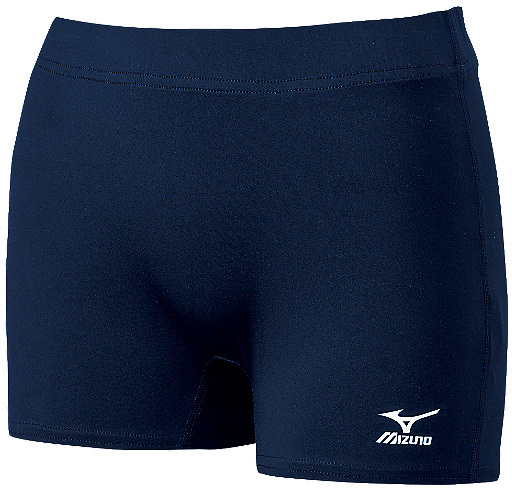 Mizuno Flat Front Spandex Colors Available: Black, or Navy Blue.